LL Bean buck over Colby's campus in fall 2008, a few weeks after starting A Restless Transplants and buying my first camera. An over ambitious sip of Joe's coffee scalded my tongue. Sucking and blowing repeatedly in attempt to ventilate my mouth, my breath hung on the cool mornings air as I sat on a rock outcropping in Central Park. Rising over Midtown, the morning's light cast long shadows over the lake and through the autumn foliage. 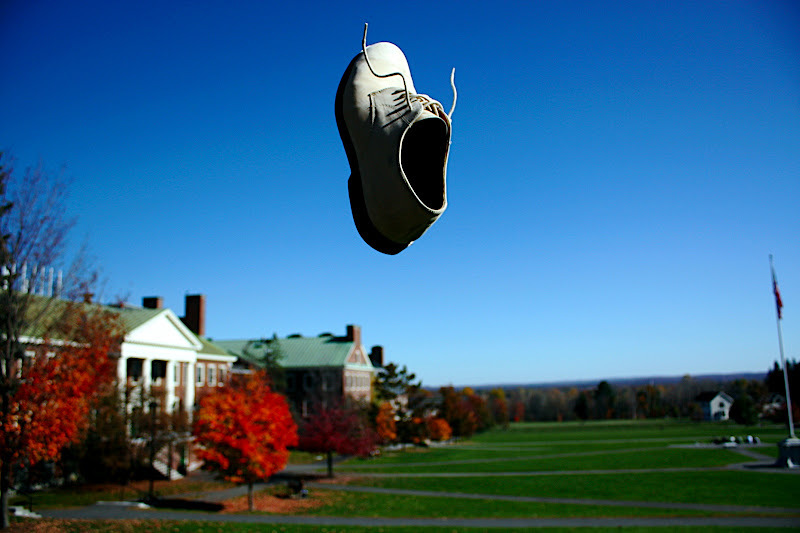 Canvas Sneaker over Colby's Quad in January of 2009. As June quickly slid into September, the reality that I wasn't returning to Maine for another winter slowly took shape. Each changing shade of foliage and brisk morning helped confirm my permanent acclimation to my new life in New York. 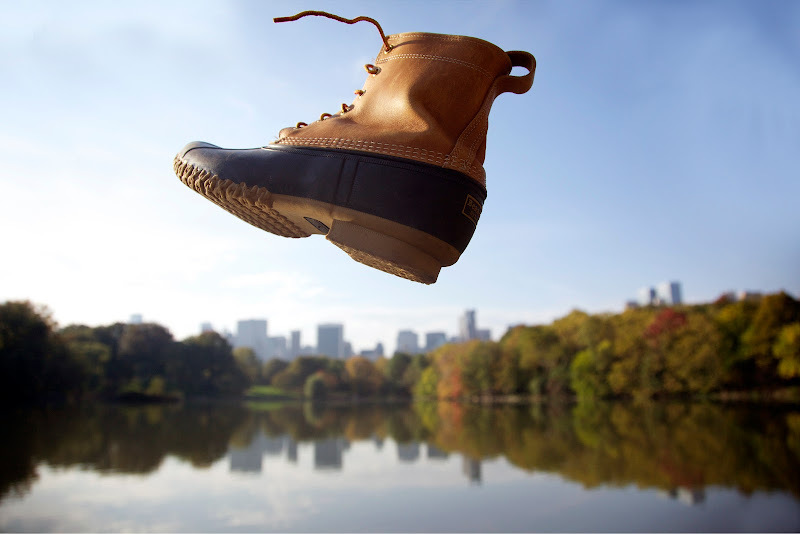 Three times in the last few weeks, I packed my REI backpack with my 5D Mark II and lenses and headed towards the rock peninsula near 79th street and Central Park West with the hope of capturing the changing season with a shoe. Despite successfully avoiding joggers, tourists and leashed French bulldogs, my shots failed to turn out. 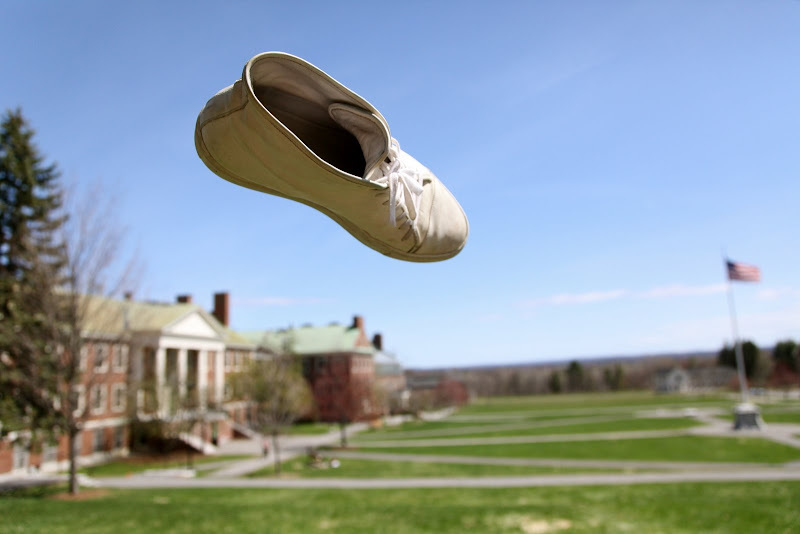 Common Projects sneaker over Cobly's Quad in March of 2009. Last Sunday morning, I woke early and dug through my pile of shoes. Perhaps as homage to my time spent in Maine or their relevance in the frequent mud puddles familiar with fall in New York, I grabbed my eight-inch Bean boot and headed towards door. The morning's light bounced the buildings of the Upper West Side as I grabbed a cup of coffee at Joe's and headed towards Central Park's lake intent on waiting for the sun to rise above the buildings of midtown. Patiently, I sat facing south towards Manhattan's skyline. Periodically testing my coffee, I tuned out tourists' conversations and turned an occasional glance at a group of forty-somethings performing a lost east Asian ritual associated with Subarus and merino wool socks. Danner Mountain Light II over Colby's quad in December of 2009. Checking my watch, I realized that fifteen minutes had marched past and I reclaimed my camera from my drawstring backpack. I removed my left Bean boot, set the frame and tossed my shoe in the air. British Walker Buck over Colby's Quad in April of 2010. Taking a sip of my now tepid coffee, I picked the boot off the exposed bedrock and tossed it up in the air for another countless shot. Reflecting off the glassy water, the morning's light warmed the chain-link sole as I fired the shutter near the height of the boots arc. Looking down at the preview screen, I couldn't help but smile. I like calling a new place home.